Today, the Atapuerca dig. The University of Houston's College of Engineering presents this series about the machines that make our civilization run, and the people whose ingenuity created them. The Cantabrian Mountain range runs across northern Spain, just south of the Bay of Biscay. The Atapuerca Mountains, so-called, are a small row of foothills to the south -- a place few people would ever have heard of, but for a battle, and an archaeological dig. The Battle, fought in 1054 AD, resulted in Ferdinand of Castile reclaiming the Basque region of Navarre for Spain. But the Karst formations in those hills yield an archaeological history far older and far more important than one more real-estate argument briefly settled by war. The archaeology came to light gradually. A small rail line was built through the hills in 1896 to connect Bilbao's steel mills with mines to the southeast. The cuts through the hills exposed a series of limestone caves. The rail line was soon abandoned and nothing more happened for a half century. One large cut eventually became a limestone quarry. One archeologist did some work there in the 1960s. But archeological digging gained real traction after spelunkers learned about the caves and began exploring them. In 1972, a group of Swiss cavers found some Bronze Age artifacts in one of them. That attracted serious interest, and it proved to be only the tip an iceberg. 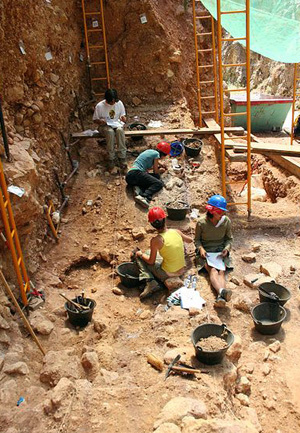 Human history unfolded in layers as the dig expanded. In one location there appeared some late cave paintings made around the time that Homer was writing his Mediterranean legends. 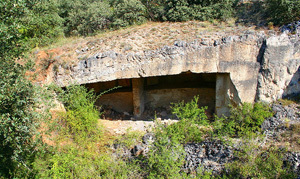 The most startling revelations lay in the Sima de los Huesos, or Pit of Bones. This pit has yielded up thousands of human bones ranging in age from 350,000 years to over a million. These hominids all lived before the fully evolved Neanderthal. Some were the known Neanderthal ancestors, Homo Heidelbergensis. But the pit has also yielded bones much older yet. So we ask who came before the first Heidelbergensis? We'd thought that it was a creature called Homo Erectus. But here are bones that lie between. Atapuerco seems to've given us a missing link. 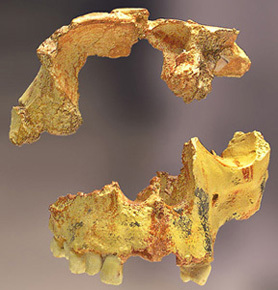 That link has been given its own name: Homo Antecessor. Antecessors stood about 5'-6". They used elementary tools. And that raises a grim suggestion. Since some of the human bones show evidence of having been scraped for their meat, these could well have been cannibals. For now, the name Antecessor is a kind of taxonomical place holder, something to call them until we better know how they fit into our evolutionary history. One possibility is that they're common ancestors of both the extinct Neanderthal and of you and me. 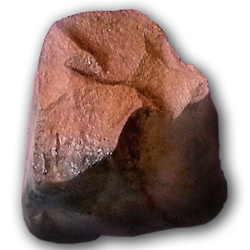 Left: Facial bones of Homo Antecessor. 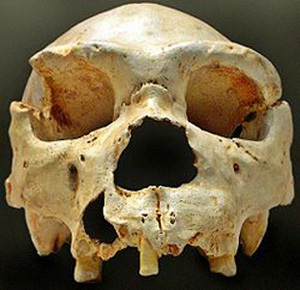 Right: A Homo Heidelbergensis skull. Both are from the Atapuerco site. You've often heard me say that learning follows only when we first identify and embrace our ignorance. Antecessor leaves us curious and questioning. Like every good scientific discovery, it raises new questions: Where did it come from, how different was it from the other old hominids in the pit? Did it bury its dead? Did it fear lightning? Did it tap out a rhythm on a log, a million years ago? For more information see the Wikipedia articles on the Atapuerca Mountains, in both English and in Spanish (The Spanish article is much more complete.) See also the Suite 101 article about the site and this very complete Grupoedelweiss article, and this article with some fine images of bones. Here are articles about the late Atapuerca cave paintings and about Homo Heidelbergensis which mentions Atapuerca and Homo Antecessor. The Spanish articles can also be read in online machine translations. I'm grateful to Prof. Marie Solino, UH Spanish Dept., for suggesting the topic. All images are courtesy of Wikipedia Commons. 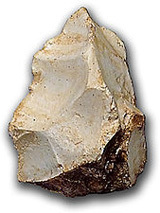 A 970,000-year-old scraper and an-over-300,000-year-old knife, both from the Atapuerca site. The Engines of Our Ingenuity is Copyright © 1988-2009 by John H. Lienhard.